"After the accident, I was sick, of course, because of the radiation. Nowadays, Glebovka is cleaner than Kyiv, with all the cars and air pollution down there." 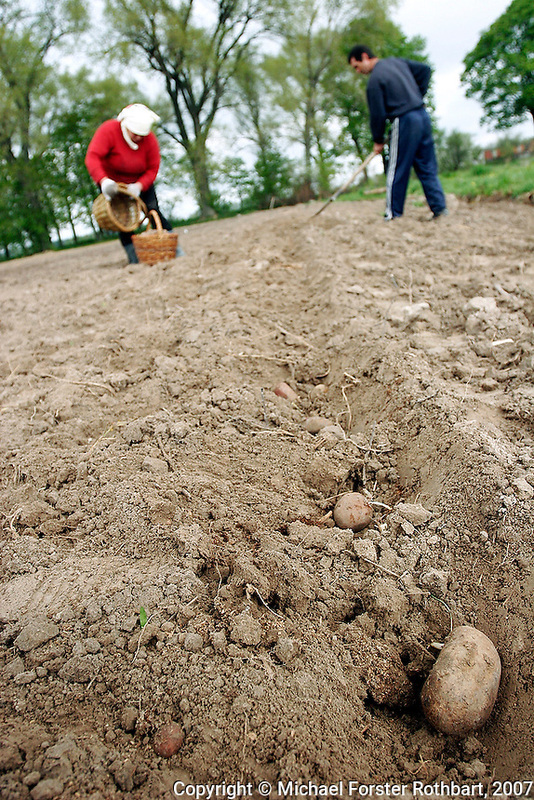 Lydia Antonovych and her husband Igor Chyernyak plant potatoes in their field in Glebovka, Ukraine, 25 miles south of the Chernobyl Exclusion Zone. Antonovych worked for four years in the clean-up effort. As compensation, the Ukrainian government gave Antonovych a 0.4-acre parcel to farm. Original caption: .Photo title:.Planting potatoes in Glebovka..Caption:.Chernobyl liquidator Lydia Antonovych and her husband Igor Chyernyak plant potatoes in their field, 25 miles south of the Chernobyl Exclusion Zone. Antonovych worked for four years in the clean-up effort...As part of her compensation, the Ukrainian government gave Antonovych a 0.4-acre parcel to plant or use as she wished. ..Quote: . "After the accident, I was sick, of course, because of the radiation. Nowadays, Glebovka is cleaner than Kyiv, with all the cars and air pollution down there. ".-- Lydia Antonovych, Chernobyl liquidator .-------------------.